Arizona will soon require public schools to teach cursive, part of a slate of new education standards approved by the state Board of Education Monday in its push to revise national guidelines known as Common Core. The new K-12 math and language arts learning standards will take effect in fall 2018. The newly adopted requirements, known as Arizona’s College and Career Ready Standards, are based on Common Core standards with revisions designed to clarify expectations and give teachers and school boards more flexibility, said state Superintendent of Public Instruction Diane Douglas. “We now have new standards that have been worked on by Arizona teachers, parents and been vetted by anti-Common Core experts,” said Douglas, who campaigned on a promise to replace the nationally-developed guidelines. According to the Board of Education, 48 percent of the Common Core standards on language arts and 40 percent of the Common Core standards on math were revised in the Arizona standards. Among the changes: The Arizona standards remove requirements that 70 percent of high school reading material be “informational,” while 30 percent is “literary.” A staff summary of the changes called those requirements “arbitrary” and “inappropriate” and said the revision will give local school boards more flexibility when choosing reading material. Arizona classrooms are expected to teach cursive handwriting through fifth grade. By third grade, students will be expected to read and write cursive letters in both upper and lower case. The cursive requirement is part of the new "foundational writing skills," standards that also include sound-letter concepts and spelling, which Douglas said was the first of its kind in the country. Second graders are expected memorize the sums of two one-digit numbers. Third graders are expected to memorize multiplication and division tables through 10 x 10.The changes drew praise from Democratic State Senator and school board member Martin Quezada. “I don’t think we repealed the Common Core. That will be what Superintendent Douglas will sell to the public. What she did do is a responsible approach in looking at it and making revisions where necessary, and those revisions were made,” Quezada said. Others questioned if the changes were necessary in the first place. Francesca Thomas of Arizona Parents Network said the new standards were the result of “political hot potato” that “tie teachers’ hands” and force instructors to be retrained. “It's terribly frustrating to me that we are spending more time making more changes instead of dealing with what we really need to deal with, which is stable, consistent funding and teacher recruiting and retention,” she said. Douglas said the changes were the result of input from more than 200 teachers and more than 10,000 public comments, and would not affect Arizona’s federal education funding. She said Arizona’s standards are now more rigorous than the original Common Core. “I would not accept them if they were lower than federal standards. This is all about improving the rigor and making them better for our children. Making them more understandable for our teachers and parents,” she said. 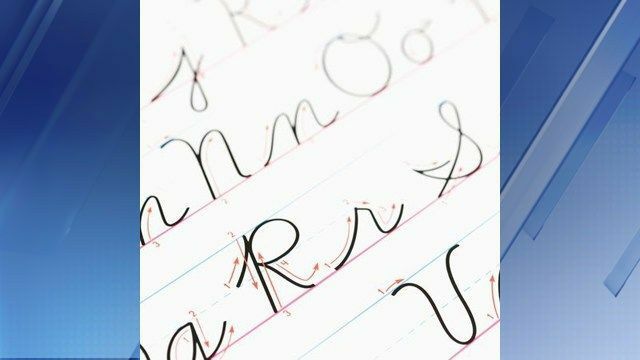 Editor's note: A previous version of this story incorrectly stated that Arizona will become the first state to require cursive writing in schools. States like Arkansas and Louisiana have already passed or adopted cursive requirements. Instead, Arizona will become the first state with "foundational writing standards," which include guidelines on cursive, handwriting skills, sound-letter concepts, and spelling conventions and patterns. Copyright 2016 KPHO/KTVK (KPHO Broadcasting Corporation). All rights reserved.